← ICD 10 Made Easy- Grab your Free Copy Today!! 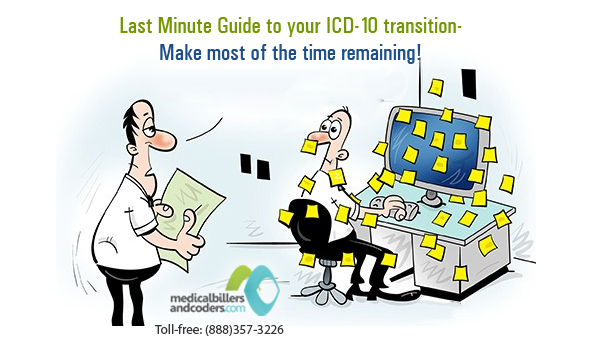 Last Minute Guide to your ICD-10 transition- Make most of the time remaining! Most of the healthcare facilities must now be all prepared to use the ICD-10 codes on Oct. 1, 2015. The new coding set, ICD-10, consists of 68,000 codes which show a dramatic increase from the 13,000 codes in ICD-9. There are still a number of providers that are unsure of how their business will turn out post-ICD-10 implementation. To assist providers in this task of transition, CMS has announced that the first year will be easy for the providers as they won’t be charged with improper coding as long as a valid code from the appropriate code family is used. Although four state Medicaid programs were lately granted the right to use coding crosswalks after the ICD-10 deadline, not all providers are banking on these exceptions to navigate through conversion period. With involvement of too many external factors, no provider can actually gauge the situation in October, regardless of their efforts to prepare for ICD-10. It will be helpful if providers can create a financial safety net by filling out paperwork for a line of credit. The best-case scenario will see the extra cash as not necessary; however can provide back up during an unpredictable time. With merely 3 days for the most talked about phenomenon, the value of accuracy over speed is something to be determined greatly. Precise and comprehensive clinical documentation and coding is the foundation for every clinical and financial step changed by ICD-10. The specificity of patient data for coordinated care, extent of data for health research and timely claims payment, will all bear origin with your physicians’ clinical documentation. Despite an initial slow documentation and claims payment, achieving this accuracy will put your organization in a better shape. Work with the coding and revenue cycle teams and ensure they are well equipped with the required information to attain precision, and help them understand that speed will not be a priority. Although it could be a tempting factor to speed up things, incorrect documentation can lead to long term significant problems. Confirm with your clearinghouse about their strategies for the post-transition timeframe. How will they be dealing with the potentially high rejection rates? Check their approach for communicating and addressing payer issues as they arise. A peace of mind coming from the clearinghouse’s readiness can give boost your confidence as the date draws closer. Doubtless of the fact that tension is at it’s peak and so is the workload, the new code set will certainly enable great clinical and financial enhancements. The initial transition period may seem difficult, but there are benefits in the long run. Keeping a positive focus and ensuring accuracy in documentation will take your practice to see successful ICD-10 transition post October 1. Download your ICD-10 e-book now for success tips for the transition. This entry was posted in ICD-10 Coding, Medical Coding, Practice Administration, Practice Management. Bookmark the permalink.